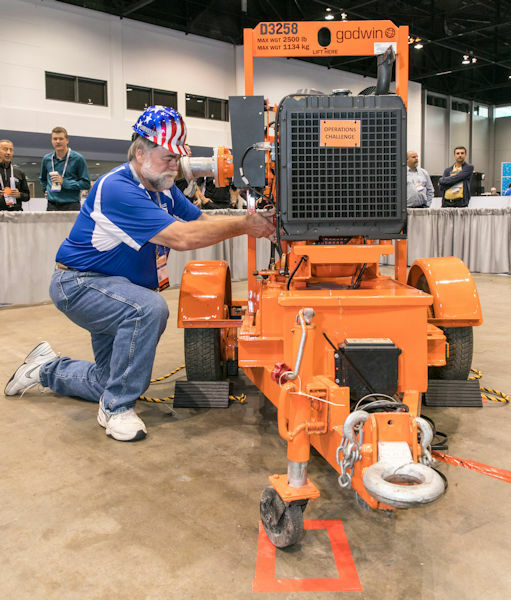 At WEFTEC 2017, James “Jim” E. Miller poses to recreate a similar image of Miller from the first Operations Challenge competition in 1988. Photo courtesy of Kieffer Photography. James “Jim” E. Miller, a member of the Water Environment Federation and Central States Water Environment Association (CSWEA) since 1977, died May 21, 2018, at the age of 62. Miller most recently had worked as a senior water and wastewater specialist and trainer at Wenck Associates Inc. (Maple Plain, Minn.). Miller, back row, third from left, stands with team members and supporters of the Shovelers, an Operations Challenge team from the Central States Water Environment Association. 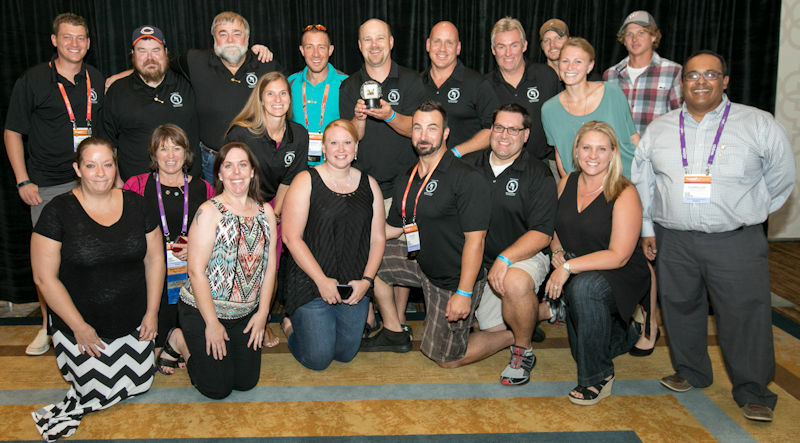 The group celebrates the team’s receipt of the spirit award for best fan support at Operations Challenge 2016. Photo courtesy of Kieffer Photography. 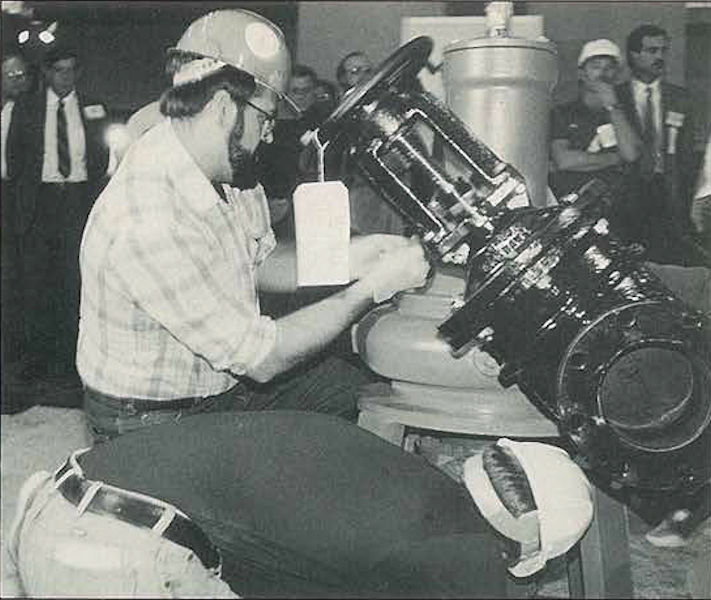 Miller competes in the Maintenance Event at the very first Operations Challenge competition in 1988. Water Environment Federation (Alexandria, Va.) photo. Many WEF members remember Miller’s involvement in Operations Challenge. He began participating in the national competition the first year it was held in 1988. After 4 years as a competitor, he moved into the role of coach for the CSWEA through 2017. “He was our Operations Challenge veteran for 30 years,” said Chris Lefebvre, member of the Central States Water Environment Association team, the Pumpers. Miller also offered a wealth of information about the sector. “He lived the field,” Lefebvre said. “Everything he did, he was thinking water and wastewater, no matter where he was.” Miller would share insights about wastewater treatment processes and recommendations about technology and equipment with Lefebvre who manages a municipal treatment facility. Bruce Nelson, executive director of the Alexandria Lake Area Sanitary District (Minn.), had an opportunity to gain insight from Miller last April. He remembers Miller’s “agreeable and upbeat” personality and appreciates Miller’s recommendations for improvements to further optimize his facility’s process control. Miller (right) coached the Shovelers team at WEFTEC 2016. In Division 2, the team received second place in the Process Control Event (award pictured) and third place in the Laboratory Event. Photo courtesy of Kieffer Photography. Dianne Mathews, senior engineer at Western Lake Superior Sanitary District (Duluth, Minn.), describes Miller as a “great resource” for when she began chairing the CSWEA Collection Systems Committee. He compared the role to a “skipper” that is “steering a big ship” and directing everyone else’s efforts to achieve success, she said. Miller also served other sector organizations in such roles as secretary/treasurer of the Minnesota Wastewater Operators Association and life member and judge of the Operators’ Competition for the Wisconsin Wastewater Operators’ Association (Baraboo).